Welcome to McKeen's Hockey. 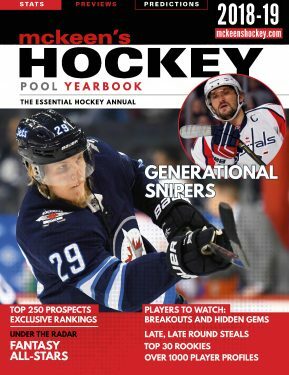 We are pleased to offer one comprehensive subscription for the online edition of our two respected annuals, McKeen’s Hockey Pool Yearbook and McKeen’s Hockey NHL Draft Guide. You can learn more and subscribe here. A subscription now includes access to all McKeen’s online content, including a digital magazine of both releases. The most exciting thing about an online version of the McKeen’s Yearbook is our ability to update it throughout the year. It will not only be crucial and current at your draft, but will provide the tools and info you need for your roster changes and trades throughout the season. We have also published the McKeen’s NHL Draft Guide annually as a PDF for many years. Produced by an experienced group with strong contacts throughout the hockey world, it provides in-depth profiles of future NHL stars. If you are interested in the upcoming NHL draft, it is a critical tool to give you an accurate and timely picture of the players that are eligible. It will include a searchable database of current scouting reports on players, but also some great premium editorial content . McKeen’s is well respected by the media and NHL personnel and can provide something of interest for fans and pros alike. You can find more detail and player page examples here. Our smart phone enabled site is a handy resource wherever you are. It is accessed through the browser on your smart phone using the same log in credentials as the website, but with easier navigation. Q: Is there a PDF, or digital version of your magazines available? There will be digital versions available of both magazines, McKeen’s NHL Draft Guide and McKeen’s Hockey Pool Yearbook. You will be able to download the document to a PDF for printing. The online version is not a PDF of the magazine. It is an interactive website with sortable charts, line combinations, team analysis, and individual player pages. This format allows us to provide real time information providing, including our McKeen’s perspective on players all season long. It offers us a lot of flexibility in how we can continue to build the site, and present information and analysis that is not possible in a PDF. Q: Where do I find the mobile web app and how do I access it? Q: How do I access the team pages? You can access the team pages through the team logos at the top of the website, or through their name links on the right hand side of the NHL Main page, in the subscription area. Q: How do I access the player pages? Most of the player names on any list, or depth chart, can be clicked through to the player’s page. They are easily found through a player search, but some of the best ways are through the line combinations, the player predictions on the team page, or the top 475 projected player list among many other lists and rankings. Search tools are available on the right hand side of the website. Q: Are the charts sortable? Yes they are. Simply click on the category heading you are interested in ranking. Q: Can I print the charts? Most of our charts are downloadable to an excel spreadsheet, in which you can add notes, do your own ranking, and print it for your draft. We will update it right up until the start of the season. We accept major credit cards. You do not need a Paypal membership to purchase. However, we use Paypal for our financial transactions. It means your credit card information is not stored on the site but kept secure by Paypal. Q: Do I automatically receive the digital magazine downloads? You must be subscribed to McKeen’s Hockey Online to receive the Digital Magazine downloads. You will need to sign in to your profile to download the PDF's. Q: I only want to subscribe once a year for my annual draft. Am I required to commit to a subscription? No. 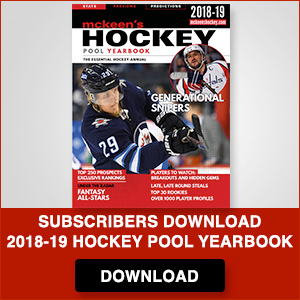 You are not obligated to continue your subscription beyond three months and can cancel at any time either through your profile on the website, through Paypal or by contacting us at info@mckeenshockey.com. You will receive the full three months of your term and there will be no further payments.